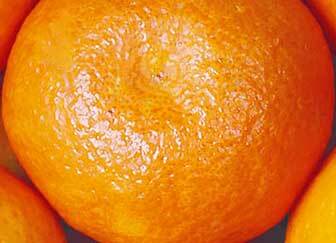 The Okitsu Satsuma has a short marketing season of just three to four weeks. This is because the fruit begins to become puffy and loses internal quality. Externally, the fruit has a fine and smooth skin that does not reach full colour until late in the maturity period. Skin thickness ranged from 2.8 -4.0 mm at a leaf nitrogen level of 2.6%. The fruit deteriorates rapidly when left on the tree and becomes soft and puffy with flavour tasting off by mid may in Sunraysia. Fruit must be clipped from the tree and handled carefully because the skin is sensitive to rough harvesting. The tree is a medium-sized, spreading tree that has an open habit and lacks high leaf numbers. They are suited to high-density planting systems. Fruit will develop without pollination. Overcropping is a potential problem leading to the severe alternate bearing. A fruit to leaf ratio of 1 fruit to 20-25 leaves on bearing trees is a recommendation for producing export sized fruit and reducing alternate bearing. This type of fruit is also very sensitive to heat damage. Successful production of Japanese Satsuma mandarins require a high level of management and expertise and should only be undertaken by committed culturists.